The word Photograph literally means: ‘drawing with light’. It is all about how much light hits your sensor or frame of film. Your camera controls the amount of light with essentially just three controls. When you are on Auto mode, your camera takes a best guess at what you are trying to achieve by striking a compromise between all three – and sometimes gets it right. But often the compromise doesn’t get you the image you had in mind. 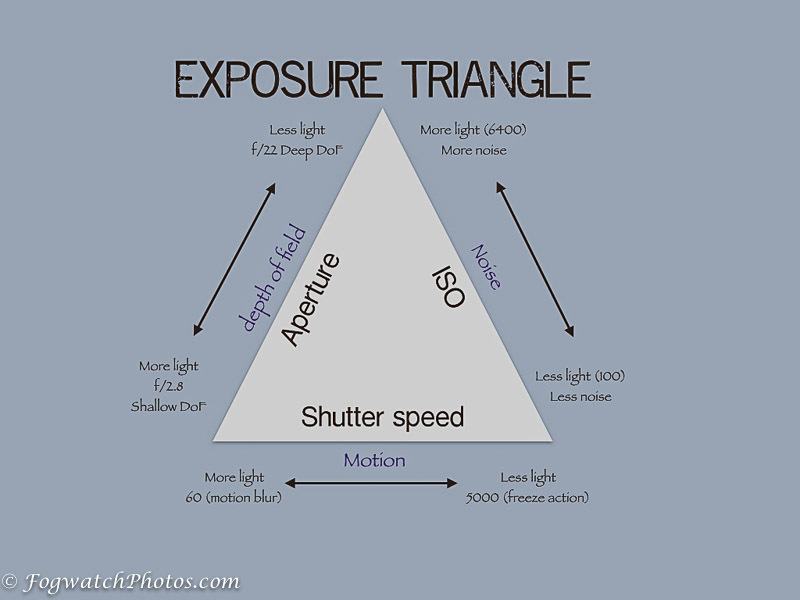 The exposure triangle is about balancing ISO, Aperture and Shutter Speed. and I’ll talk a bit about each in turn. ISO is about how sensitive your sensor (or film) is to light. And it works like this: if the light is bright then you need to reduce the sensitivity or your image will be washed out. So on a bright day you might use ISO100. On an overcast day you want a bit more sensitivity so you increase it to around ISO400. But if you are in a museum where it can be quite dark, and you are not allowed a tripod, you probably want to push the sensitivity up high to, say, ISO1600 or ISO3200 so you can use a faster shutter speed and not shake the camera. But there is a trade-off. the higher the sensitivity, the more your camera picks up on hot spots in the sensor which leads to noise on your image – coloured speckles. If you are photographing a live concert that noise might actually add atmosphere, so don’t let it worry you. What does ISO stand for? ISO is a pseudo acronym for the International Organisation for Standardisation – or some might prefer International Standards Organisation as it rolls off the tongue more easily. Aperture is about your lens, not the sensitivity of the sensor. Aperture is how wide open or otherwise is your lens. Inside your lens, behind all those glass bits, is a mechanism the operates a bit like the iris in your eye. And this iris mechanism opens or closes according to how much light you want to flow through. A wide open aperture gives you more light and a shallower depth of field (in other words your subject is in focus, but the background is blurred out – great for portraits!). But a closed down aperture is better for landscapes as it keeps just about everything in focus. The F number is given as a ratio of focal length divided by the diameter of the opening. So it works like a fraction. For this reason the F numbers seem to go in reverse – f/2.8 is wider than f/22. But it makes sense if you think of it as f/2.8 is like just over 1/2 and f/22 is like one divided by 22 – which is very narrow indeed! Shutter speed controls the amount of time that light is allowed to fall on the sensor. A fast shutter speed lets in less light and is good for freezing action – great for sporting events or just to catch a person in mid air during a jump. A slower shutter speed gives you motion blur – which is great for silky waterfalls, smoothing out ripples on a pond, or to express speed, such as panning with a car so the background is blurred, giving a sense of motion. If you are holding the camera in your hand, then a good rule to avoid camera shake is to set your shutter speed no slower than the focal length of the lens. So if you have a 50mm lens then your slowest should be 1/50th of a second, but if you have a 300mm lens then your slowest setting should be 1/300th of a second. Any slower then you should be using a tripod. Aperture controls depth of field, shutter speed controls motion, and ISO controls noise. These three settings will give you complete control over your camera.